Finances are a huge cause of stress, anxiety and depression in our country and in the world. The economy currently is not seen as bright spot in USA or the world. I hear about businesses closing overnight and people losing their jobs, pensions, savings and homes and I don't even watch the news or read the paper!!! Why not be solution oriented? You can reduce your levels of stress and anxiety by creating extra income. You create freedom to do the things you want, when you want. The coolest thing about the internet (I think) is that whatever your passion is, you can start writing about it or creating video tapes of your passion and post it to the internet. I have tried probably a dozen times to get a website going and the company that hosts this website allows me to succeed! Why not consider a part-time online wealth building business? If you have ever read Robert Kiyosaki's Rich Dad Poor Dad you would have learned about having a wealth generating plan apart from your nine to five job. I have been a firm believer of this my entire adult life. Anybody who knows me personally knows I always am looking at opportunities for increasing financial freedom. Since this site is about reducing stress, anxiety and depression I am committed to reporting to you the wonderful opportunities that abound for creating a life you love...a life that leads toward financial freedom. You may have fear and trepidation about starting your own business but you are not alone. Most people have never had their own business yet almost seventy five percent of people on-line are considering starting a home based business! The desire to secure our own financial future has never been higher. More and more people are determined to decide for themselves how much their time is worth versus how much a particular job is worth. With a home based business you determine how much you earn, based on your determination, focus and ability to learn. Surfers are equally fifty percent women and men, but women spend eighty percent of the money online. Do you think you can relate to women? Then you have a wonderful chance at creating financial freedom in a low risk on-line business. I have tried all kinds of businesses and have a good sense now at how to succeed and where to find successful opportunities. 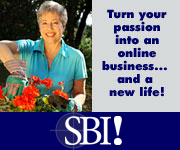 An on-line business may or may not be for you right now, as we each have our own comfort level. I love how we are each unique! The first opportunity I'd like to discuss is obvious. It is Solo Build It! This is the company that hosts this JoyStream site. They have a free affiliate program where you can share this wonderful business opportunity and you earn extra income that leads towards wealth. It has one of the most generous affiliate programs I have come across. You can add this income generating option to a website you already have, you can easily promote it on most social networking sites, or they have an entire course that teaches you everything you need to know to start a new or your first wealth building business from scratch! With the Affiliate Program, you generate wealth each time you refer someone to Solo Build It! and you earn renewal commission each and every year that they renew their annual subscription! Smart wealth builders know renewal commission is key! Renewal Commission is known as Passive Income.Passive Income is when you do no extra work but you keep earning money on the same sale! Also, as you refer people to the Solo Build It! business opportunity you earn commissions on the a two tier level on sales generated by those affiliates. Solo Build It! tracks all your sales, they are fair with tracking your sales and they are committed to your success. I am very passionate about this company and the affiliate opportunity, but they also teach you how to make money doing what it is you love. No matter what you are interested in, what your hobbies are, what your experience entails, you can find success building a part time, work from home business where you cannot be fired or laid-off. They have the most amazing website hosting program on the planet...Site Sell. They do so much work behind the scenes so you don't have to, don't know how to and don't have to learn how to! If you already have a website and are not happy with your traffic or with your income from ads, try switching to Site Sells Websites. It is a comprehensive site that teaches you every step to take to create your own income generating web site. It has all the tools you could ever need, use or want and it has all the training, forums and customer support that you look for in web site hosting. Please feel free to check out one or more of the links and see for yourself! They explain it much better and more thoroughly than I ever could.